Ombrelle SPF50+ UVA/UVB 100% Mineral is a sun protection lotion made with titanium dioxide, a sun filter of 100% natural origin. Designed for sensitive skin, it helps prevent sunburn and is water resistant (80 minutes). This hypoallergenic lotion is fragrance and colorant free. If this product is used as directed with other sun protection measures (see directions below), it decreases the risk of skin cancer and early skin aging casued by the sun. 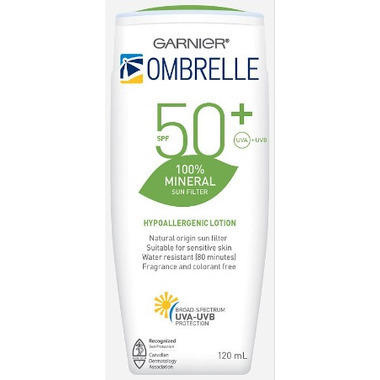 Ombrelle 100% Mineral SPF 50+ is a sun protection lotion made with titanium dioxide, a sun filter of 100% natural origin. It helps prevent sunburn and is water resistant (80 minutes). Lotion specifically formulated for sensitive skin. This hypoallergenic lotion is fragrance and colorant free. If this product is used as directed with other sun protection measures, it decreases the risk of skin cancer and early skin aging caused by the sun. Fragrance and colorant free. Directions: Apply generously and evenly 15 minutes before sun exposure. Reapply at least every 2 hours, after 80 minutes of swimming or sweating and immediately after towel drying. For use on children less than 6 months of age, consult a health care practicioner.